The hygienic way in which dairy products are introduced means a clean machine and reduces the possibility of product contamination. 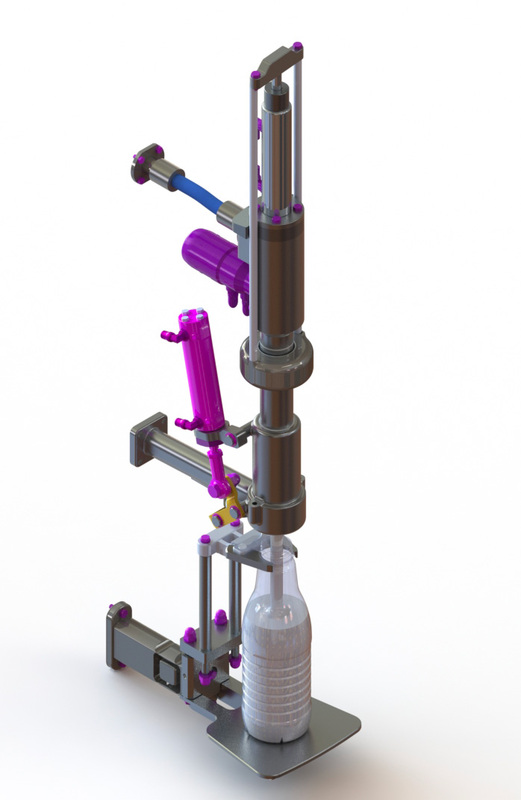 Each filler head has its own feeder pipe connected to 3A standard sanitary fittings, allowing each filling valve to act independently. Technical design providing adaptability between weight filling and mass flow filling. Optimal filling capacity for the 2 technologies in terms of production speed, efficiency and optimisation of the surface utilised. A common frame with several possible structures, allowing for the inclusion of numerous environmental options. 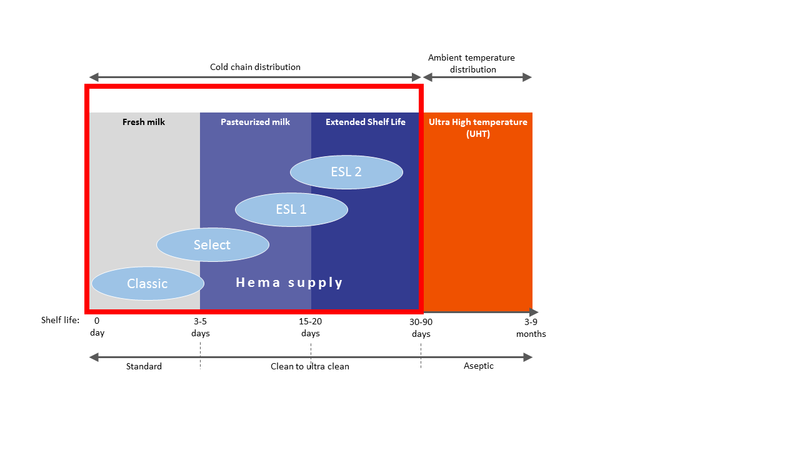 The Quatro Sensi filler series is dedicated to the sensitive dairy products market and it benefits from Hema’s many years’ experience, particularly in the filling of milk and liquid dairy products for leading international groups. Whatever the sensitivity of these dairy products is, we are very attentive to Food Safety. Fresh, pasteurised, UHT or extended shelf-life (ESL 1 or ESL 2), our range of filling and capping machines has been designed to meet your specific needs. The Filling method is carefully chosen to match the intrinsic characteristics of your dairy product: its type (e.g. liquid, thick, with or without particulates), what needs to be protected (flavour, vitamins, colour, etc. ), its shelf-life (short or long), its sensitivity to external elements (temperature, oxygen). It is a complex equation between relative acidity (pH), the presence of nutrients, presence of O2, sugar content, preserving agents, artificial colourings, stabilisers, which all have an impact on the conservation and bacteriological quality of your dairy product. Our deep understanding of our customers’ dairy product specifications relating to filling has led us to put in place 4 environmental filling families. They mainly depend on the dairy product (weak or high level of acidity), the distribution circuit (cold chain or room temperature) and the expected shelf life of the product. For example, fresh milk distributed through the cold chain can be filled by the Classic or Select process and does not require container treatment. 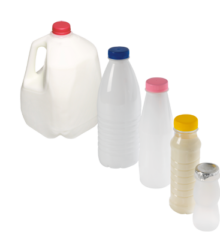 Whereas ESL dairy products require clean or ultra-clean treatment, including decontamination of the bottle and cap. Air-filtering through a Hepa filter is provided, thanks to an air overpressure system including adjustable hygrometry and temperature control. 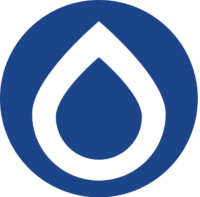 Our fillers meet the highest hygiene standards. They are 3A certified and we are a member of EHEDG. By means of individually controlling the net weight of a dairy product, every bottle that enters and exits the filling machine is checked. The micro-processor in the electronic load cell pilots the filling according to the weight of the bottle. For drinking yoghurts and other dairy acidic products, the Essential filling valve (We) meets the highest hygiene requirements. For more sensitive utilisations, Quatro Sensi is equipped with a magnetic filling valve (Wg). 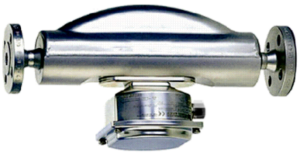 This valve guarantees perfect leak-proof between the product circuit and the environment, without using a membrane or rod. 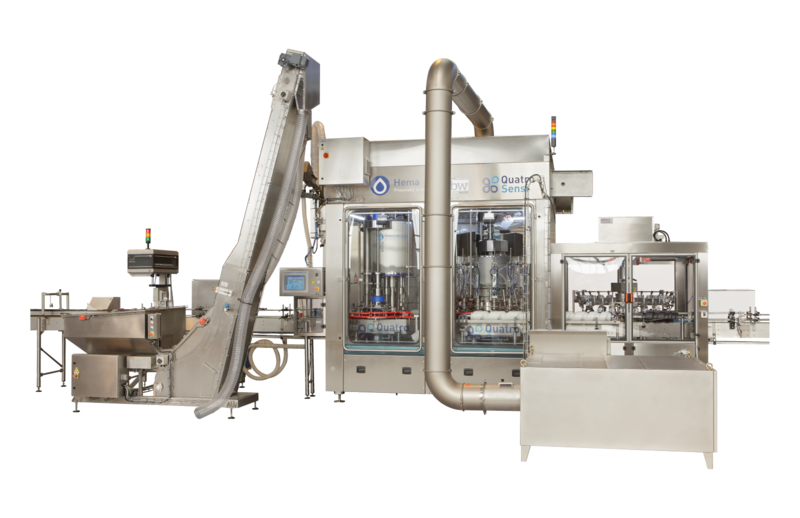 The highly precise piloting of the filling regulator (2 different speeds: high and low) obtains optimal filling accuracy, according to the format of the bottle, the bottle-neck space, the temperature and type of oil. We guarantee a standard deviation of less than 0.5 grams for 1 litre. Thanks to its patented double flap valve, Quatro Sensi makes it possible to fill volumes from 80 ml to 5 litres at optimal speeds and without changing nozzles. The capping turret in a clean and ultra clean configuration meets Classic, Select and ESL level hygiene requirements. Hema Quatro Sensi is equipped with a reduced-sized hopper and remote nozzles, ensuring minimal product loss between recipe changes. The principle: one speed, one measurement. 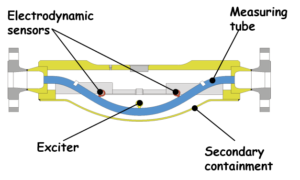 This type of doser measures a mass which is dosed using a Coriolis sensor. Moreover, this type of sensor measures the dairy product density, temperature and speed. The mass-flow filler is equipped with the latest checking technology and delivers clean dairy product filling. The environment is hygienic, and the filling is precise, whilst keeping maintenance down to a minimum. The capping turret in a clean and ultra clean configuration meets Classic, Select and ESL level hygiene requirements for your dairy products. 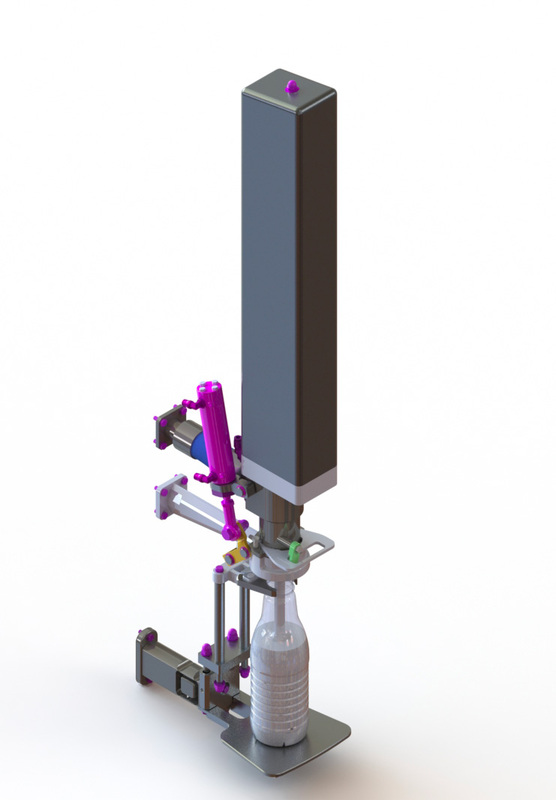 Our filler is equipped with a reduced-sized hopper and remote nozzles, ensuring minimal product loss between recipe changes. In ESL configuration, the decontamination of PET, PEHD or glass bottles and caps is done by pulsed light or wet or dry decontamination. Quatro Sensi can be linked up to the cleaning station for distributing or collecting cleaning products (provided by customer or ourselves); different automated cycle options are available, according to the process or product specifications.